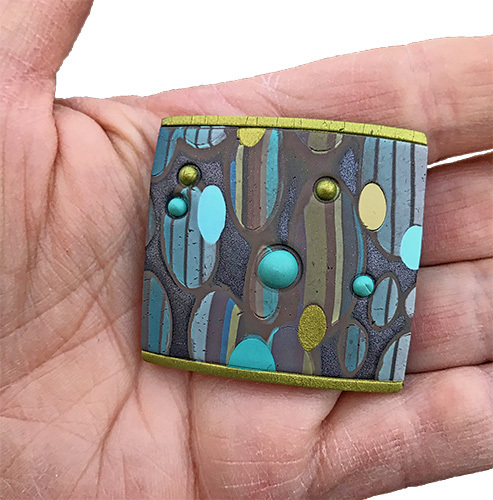 California’s Meisha Barbee began this brooch with a slice of stripes in her wonderful colors. I might have stopped there but she wanted to push on. 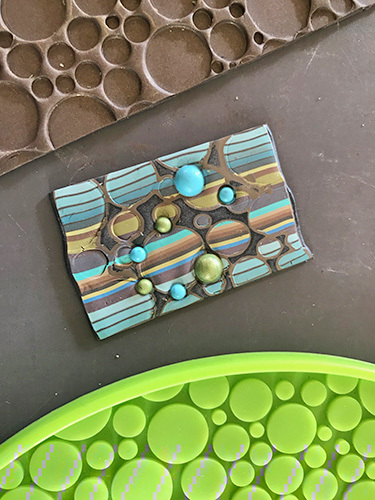 She was fond of her silicone trivet with a bubble pattern (strange in-process shot) so she made a mold of it and used that mold to create a mokume gane pattern on top of the stripes which looked weird to my eye. Meisha kept going and added random balls with her Etch ‘n Pearl tools. Better, but I wasn’t loving it. Stretch, make a border, bake over a lightbulb and wow! A retro pin is born…along with a lesson about following your vision. So I’m back to daily posting, refreshed and wiser and following my vision thanks to a month of being with friends who know the importance of following theirs. So happy you’re back! And refreshed, and reconnected! Missed your emails and glad you’re back! Glad that you are back and feeling positive. I always enjoy your inspiration. Glad you are back and leading off with Meisha’s beautiful work. I missed your daily dose of polymer and miss Meisha too. oooh! It’s my favorite new trivit (aka texture plate) too! I must make a mold of it now too!